‘The organisation is getting to the point where I no longer know who everyone is or what they are doing,’ remarks curator Dr Nicholas Tromans as we walk down the hill towards the chapel at Watts Gallery Artists’ Village in Crompton, near Guildford in Surrey. Tromans joined Watts Gallery Trust in 2013, two years after ZMMA finished refurbishing the original 1904 picture gallery. Tomorrow marks the next stage in the site’s development, with the opening to the public of the renovated and extended studio of celebrated Victorian artist George Frederic Watts. Over just more than 10 years, the self-styled Artists’ Village has transformed from a crumbling collection of buildings and homes in private ownership to absorb an extended first-rate gallery, chapel, cemetery, studio, workshop and café – and it is on the cusp of paying off a private loan for Watts’ home, Limnerslease, at the centre of the site. Watts Gallery now employs 55 staff, alongside a further 300 volunteers, and draws around 37,000 visitors a year. It’s come a long way from the tales of chickens running around freely, leaky roofs and the shift rota for the volunteers that used to take tours. Work on Watts’ studio is also by ZMMA. Forming the east wing of the main house, it was commissioned by Watts and his second wife, Mary, as part of a live/work winter retreat to escape the trappings of London. ‘The studio is a three-year project which is in a sense coming back to where the whole story began – when the Watts’ moved out of Holland Park to take up a winter residence here from 1891,’ explains Tromans. Watts died in 1904, but Mary, who was 31 years his junior, continued to live in, work in and transform the site until her death in 1938, when it passed to their adopted daughter Lilian. The house was taken over by bomb making company Ardente during the Second World War, before being bought and split into three by sculptor Est­court James Clack in the 1950s. 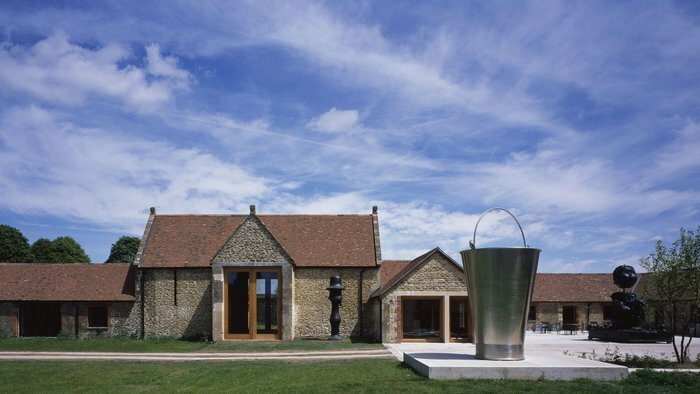 The intervening years saw the house, in particular the studio and galleries, much altered, as it moved between different private owners until a local architect bought the studio and middle section. By coincidence, when the architect came to sell, so did the remaining west wing owner. It was at this point in 2011 that the Trust gathered a handful of generous investors willing to hold the building for five years interest-free while it raised funds to buy. That loan expires this year, and although not quite enough money has been accumulated, the Trust hopes other potential donors will be tempted by seeing the studio first and intrigued to know what is on the other side of its closed doors. The first signs are promising. Selected in two competitive tender and interview processes, first as architect and then as exhibition designer, ZMMA’s project deals with the section of the original house containing the studio and a later gable-ended annexe for workshop storage to its side. ‘The challenge here was to make the public entrance to the studio distinct from that to the house,’ explains Adam Zombory-Moldovan, director at ZMMA. A small extension to the rear of the original addition accommodates a new staircase and re-orientates the building to face the back garden, so visitors can enjoy the view of a new gently winding path through the woods off Pilgrim’s Way. From the top of the hill and at the forecourt, visual links are now visible from where Watts worked to the exhibition in the gallery in the valley below. In the new remodelling, significant Ernest George-designed architecture and details have been reinstated and conserved. On the exterior, this has meant restoring the walls and windows. Meanwhile, the new extension is a modern domestic-scale timber structure continuing the visible timber frame facade of the original house. This extension, which is more like an extrusion of the original annexe, has been configured using oak, terracotta tiles and painted timber boarding to replicate the constructional and material honesty of the Arts & Crafts original. Inside, the building opens into a tastefully and carefully detailed modest two-storey exposed timber entrance hall containing an oak stair. A double-height window fills the space with light. Shadows pick up the detail of the frame and stream across the floor from slender balustrades. Downstairs, Watts’ former canvas room has been converted into a conservation studio that will have its own resident conservation fellow and a former kitchenette has been turned into a learning room that can accommodate up to 30 children. In addition to the 50 school groups that will attend the Artist Village this year, the intention is to restart the Thursday evening terracotta modelling class for locals that Mary initiated at the turn of the last century. In a move that reserves the downstairs for ‘doing’, upstairs is displayed the history of Watts Gallery that it is hoped will inspire new work and attract visitors. Moving through two galleries first, the Compton Gallery introduces the Watts family; the other is dedicated to the artistic work of Mary. But as two small rooms effectively reconditioned into a minimal contemporary space, the galleries are slightly formal and slow. It is unfortunate then that these are the series of rooms which create the build-up to the main event: Frederic Watts’ studio itself. This is the centrepiece that until this point has not really been treated deservedly, given the agreeable, if uneventful, journey towards it. In a completely different approach to all the previous rooms, the curators have used contemporary photographs and journalistic accounts from the Trust’s archive to restore the studio to what it was like when Watts worked there. Painted deep red with a south-facing double-height window for winter daylight, the room is packed with original easels, artworks, collected curiosities, painting paraphernalia, oils, brushes and even a specially commissioned scent flown back from Los Angeles. Unlike the two galleries, the studio focuses on technique and process so there are many incomplete works on display, including Florence Nightingale and Watts’ final self-portrait. The space is characterful and authentic, mixing new objects with old, and dominated by Watts’ The Court of Death, which hangs ready for finishing touches on a building-scale easel. The floor hatch to lower the artwork to paint the top has been reinstated. As if walking back into the Victorian studio of one of Britain’s then most acclaimed portrait painters, visitors are encouraged to move around freely here, unobstructed by barriers and railings. And the complexity of this exhibition masks the architectural reconstruction work, including the removal of a 1970s mezzanine floor which cut through the space. Necessary alterations for insurance purposes, including new oak shutters and a lengthened picture slot window, are subtle and do not detract from the overall productive atmosphere. The outcome of all this work is that ZMMA has largely created a polite, soft building and exhibition, appropriate to an increasingly commercial and expanding organisation. It has lost character along way, creating an unclear journey and experience. Is it a house museum, or a contemporary gallery? With the type of displays here, more distinction between old and new architecture would have been welcome. The beautiful details and carefully chosen materials are attractive in their own right, but overly sensitive and not overwhelmingly exciting or interactive as a museum really needs to be. Intermittent references to the architecture of domesticity create an air of stagnation that fails to capture the progressive social values intrinsic to the Watts’ narrative. It is a pleasant experience but one that, without my own artistic purpose/project, would not quickly draw me back. More of the studio’s informality in the other galleries, and less sanitisation throughout, would have been more fun and artistic. As with Watts’ own personal endeavour to paint portraits as good and lasting as Rembrandt’s, one cannot help feeling that the Dutchman’s studio museum in Amsterdam also did it better. I await the conversion of the remaining house.